The DeWitt Take a Breath for PH and Get Moving for MS: Half-Marathon Run, 10K, 5K and Free Mackenzie's All-Abilities 1/4 Mile Run/Walk will be held on Saturday, May 18, 2019 at the DeWitt High School Track. Online registration is available through Wednesday, May 15, 2019. Paper Registration is also available. Mail completed form and payment with check made payable to "Pulmonary Hypertension Association". To register after Wednesday, May 15, participants can go to Registration and Packet Pick-Up: Friday, May 17, 2019 from 4:00-7:00 at Playmakers or Day of Race at the DeWitt High School Track from 7:00am until 15 minutes prior to race start. To be guaranteed a shirt registration must be completed before May 1, 2019. Cancellation or delay of race may happen due to adverse weather. View the Adverse Weather Policy. For the safety of yourself and the other participants, baby joggers, strollers, baby carriers, baby backpacks, inline skates, motorized scooters, bicycles, skateboards, crutches, walkers, and animals of any kind are prohibited from the course. If you are seen in violation of one of these you will be removed from the course and transported to the finish line area. Remember this is an open course! The road is shared with vehicular traffic. Use caution at all times. It is the athlete's responsibility to know and understand the courses. In the event of an emergency, please obey all officials and emergency vehicles. The event will be held rain or shine. Race officials reserve the right to postpone or cancel the event due to dangerous weather conditions. Please review the Weather Policy. Registration fees are non-refundable. Event operations will shut down when lightning is 10 miles out from the event areas. Event operations will not resume until the lightning is 10 miles out moving away from the event areas. The Race Director(s) will determine this using the *Flash to Bang Rule* and weather radar. The Race Director(s) will consult with local police on a course of action to utilize the operational rain plan, delay the event, or cancel the event. Each race could be delayed a maximum of one hour. *Flash to Bang Rule* is applied by measuring the time (in seconds) between a visual lightning "Flash" and hearing the resulting "Bang". This time is then divided by a factor of "5" to obtain distance in miles. For example, 50 seconds between "Flash" and "Bang" divided by "5" equals 10 miles. As a reminder, the registration fees are non-refundable. Medical support is provided by DeWitt Area Emergency Services Authority and is available at the 4.5/2 and 9 mile aid stations and at the finish line. View the Medical Instructions for Participants. This is an open course. Racers will be sharing the road with vehicular traffic. Use caution at all times. It will be the athlete’s responsibility to print maps, and know the courses. MP3 players on the course are not recommended so racers can hear vehicles and on-course directions. All racers and spectators MUST obey all officials and emergency vehicles on the course at all times. Each course will be marked on the left side of the street (going against traffic), with the following exceptions: Clark Rd, Schavey Road going north, and Herbison Road. Runners should stay on the left side of the road except in those areas. Sidewalks will be utilized during portions of the 10K and Half-Marathon course. Starting lines will be outside of the track (the Kids 1/4 Mile Run will be entirely on the track as noted above). The Half-Marathon, 10K and 5K races will start from the same place, just outside the main gate of the football stadium. The Half-Marathon and 10K will head south toward the high school while the 5K will head north towards Herbison Rd. For all races, there is a gravel path at the corner of W. Geneva Dr. and Riverview Dr. (near the water station at mile 4.5/2) that runs for approximately 100m. Please use caution on this path, as the gravel may shift, and it is on an uphill grade. The Half-Marathon has a stretch of approximately 800m of dirt road on Norris Road (around mile 10), beginning at the turn at Cutler Road. Use caution, watching for stones and potholes. The Kids 1/4 Mile Run will start and finish on the DeWitt High School track. The route will be one lap of the track, finishing at the same finish line as the other races. All kids will receive a finisher medal. Adults are welcome to walk/run with the kids, or carry them as needed. Email updates will be sent out as needed. Most up to date information will be posted on our Facebook page at DewittRacePHMS and on our Twitter feed at @DewittRacePHMS. Race day communications will be posted on our Facebook page and announced via the public address system at the start/finish line. 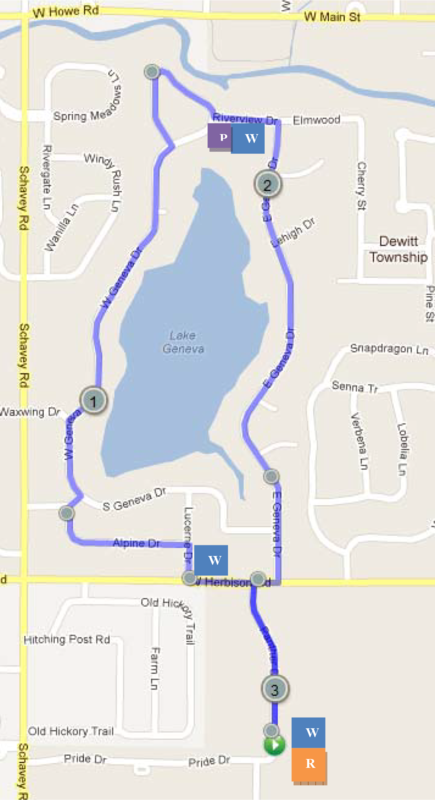 The race course is run on roads and sidewalks throughout DeWitt, MI. The course is fairly flat and will start outside the DeWitt High School Track. All distances end on the DeWitt High School Track. 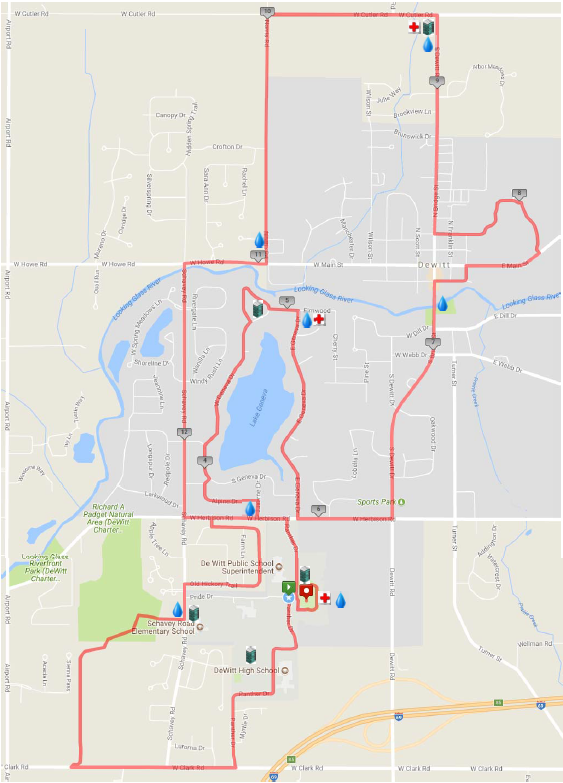 The 10K and Half-Marathon follow the same route for 5.5 miles. The first 3 miles of the 10K and Half-Marathon course are a gradual downhill and are on the road. Miles 3-5.5 are on the road and go around a private lake. At mile 5 there is a gravel path with an uphill climb. Miles 5 thru 6 will have both inclines and declines and is split between the road and wide sidewalks. The half marathon continues on to miles 6-7.5 on the sidewalk passing several of DeWitt's City Parks taking runners downhill and across the Looking Glass River and into historic downtown DeWitt. Miles 7.5 - 8 travels through a private wooded retreat center with miles 8-10 taking runners out into the country where for a half a mile runners will run on a dirt road. The last few miles are a gradual uphill. 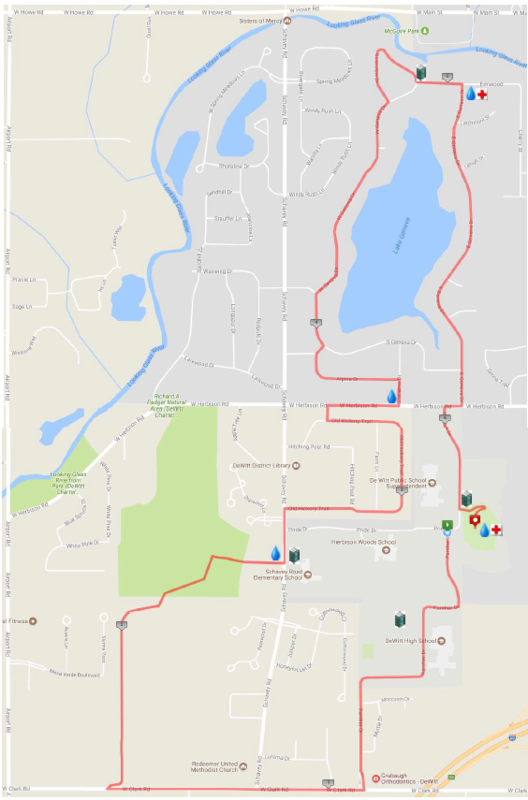 The 10K and Half-Marathon follow the same route for 5.5 miles. The first 3 miles of the 10K and Half-Marathon course are a gradual downhill and are on the road. Miles 3-5.5 are on the road and go around a private lake. At mile 5 there is a gravel path with an uphill climb. Miles 5 thru 6 will have both inclines and declines and is split between the road and wide sidewalks. The 5K course goes around a private lake and has a gravel path at the north end of the lake. All traffic will enter from Schavey Road and Pride Drive. North Panther and South Panther will be closed to incoming traffic. All traffic is to exit via South Panther. From the North, South and East: Take I-69 to Exit #85 (DeWitt Road). Turn south off the exit then right (west) onto Clark Road. Turn right (north) onto Schavey Road. Enter Pride Drive on the right and follow the directions of the parking attendants. From the West: Take I-69 to Exit #84 (Airport Road). Turn north off the exit then right (east) onto Clark Road. Turn left (north) onto Schavey Road. Enter Pride Drive on the right and follow the directions of the parking attendants. Entry to the event from Herbison Road onto North Panther Drive is closed from 7am until after the last racers have finished. Entry from Clark Road onto S. Panther Drive, and exiting via Pride Drive onto Schavey Road will be allowed after the last 10K or Half-Marathon racers pass that point of the race (approximately 8:45 and 9:30 respectively). Traffic in and around the race course will be monitored by the DeWitt Township and the City of DeWitt Police Departments. In order to ease traffic congestion and keep the participants safe, the following areas are recommended for viewing the race. We ask that for the safety of our runners there be no traffic along Herbison Road, West Geneva or East Geneva. Also any bags brought into the stadium will be subject to being searched. Please plan ahead, knowing the timing and routes of all events. ChronoTrack Chip Timing are being provided by Michigan Running Foundation. Results for each race will be accessible live online via kiosks near the finish line. On course and finish line photography services are provided by TCP Image Company.